Pakistan's new Chief of Army Staff Raheel Sharif belongs to our District Gujrat. His roots are in the town of Kunjah in District Gujrat. His father Major Sharif is Major (R) of Pak Army. 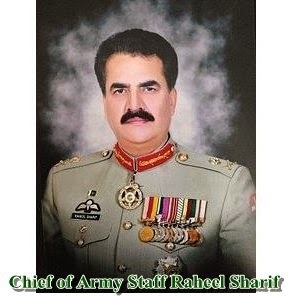 Raheel Sharif is the younger brother of Major Shabbir Sharif Shaheed (Nishan-e-Haider). He is four star General and Chief of Army Staff (COAS) of Pakistan. He was born on 16 June, 1956 in Quetta. His father was army officer who belongs to a town of District Gujrat. He is the brother of Shabbir Sharif Shaheed who fought Indo-Pakistan War of 1971 and received Nishan-e-Haider. He is also nephew of Major Aziz Bhatti Shaheed (Nishan-e-Haider). He has 2 sons and 1 daughter. On 27 November 2013, Sharif was appointed as the 15th Chief of Army Staff of the Pakistan Army by Prime Minister Nawaz Sharif. However, he will take charge of COAS Office on 29 November, 2013 after retirement of General Ashfaq Parvez Kayani. Watch following video about home, hometown and school of General Raheel Sharif. Also watch following video about the great family of General Raheel Sharif. I am proud to be a Kunjahi because raheel shareef born in kunjah..